Join Skinny Larry and his partner in crime, Tiny George, as they run from Constable Slim McThin. The graphics might not be the best, but the bonus features make this game worth a spin. Throughout the Cops N’ Bandits Slot you will have plenty of opportunities to earn Free Games. With a total of 30 paylines, you’re sure to hit a winning combination at some point while playing. 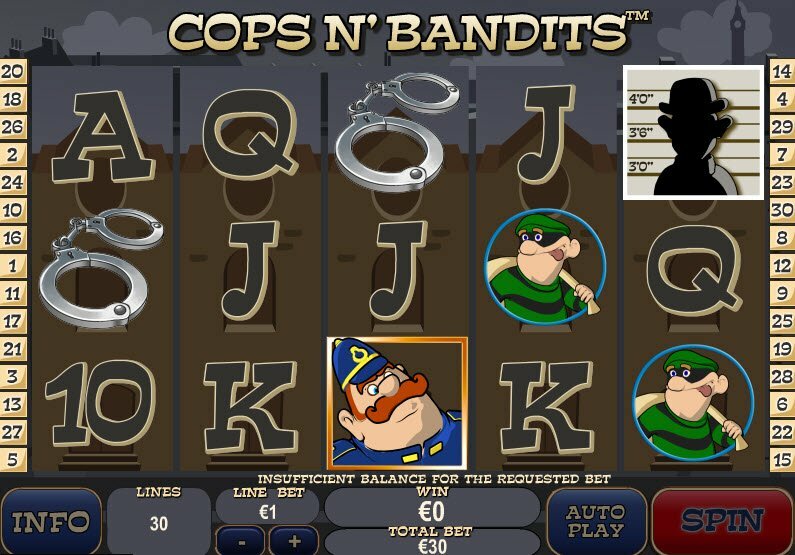 Powered by the Playtech software platform, the Cops N’ Bandits Slot includes many special features such as a Locked Wild along with a fun Bonus Round where you must choose the criminals in a police line-up. The theme recreates a police chase between cops and robbers that’ll have you on your feet waiting for those lucrative cash payouts! Based on the excellent graphics featured in the introduction, you come to expect the same during the actual slot game. Unfortunately, the Cops N’ Bandits Slot lets you down in terms of the game design and graphics. The game features pretty rudimentary images of Slim McThin, Tiny George, and Skinny Larry along with typical criminal icons such as handcuffs and mug shots. 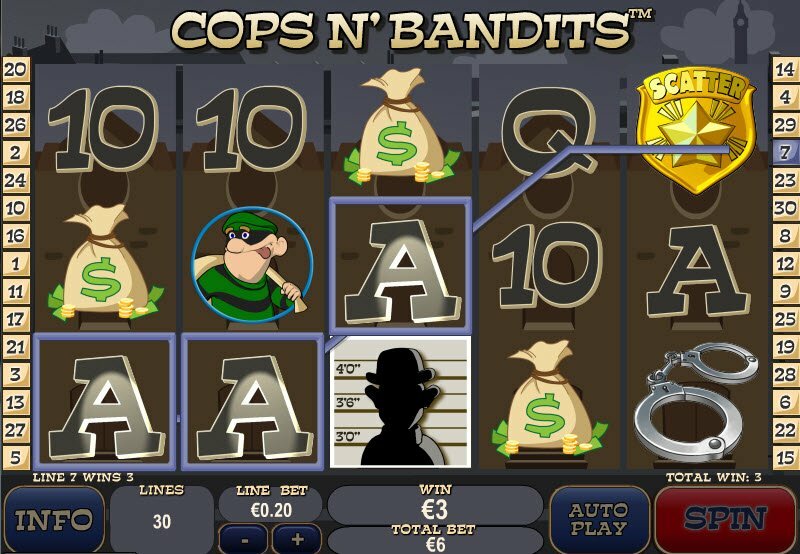 With so many other online casino games offering 3D graphics, the Cops ‘N Bandits Slot just doesn’t have what it takes. That being said, those who would prefer a slot machine with graphics that look more like cartoons may enjoy the graphics in this slot. In addition, the game captures the crime theme very well. Those who would prefer a slot machine with graphics that look more like cartoons may enjoy the graphics in this slot. In addition, the game captures the crime theme very well. The game features represent the major redeeming factor of the Cops N’ Bandits Slot Machine. During the game you have many opportunities to win Free Games, Locked Wilds, and access the Cops N' Bandits Slot Bonus Game. Landing on three police badge icons anywhere on the reels triggers the Free Games Feature. Choose one of the three badges to determine the number of Free Games you win. When even more than three appear, you can choose two. The two numbers are then added together, and you win the cumulative number of Free Spins. During the Free Games, the Locked Wild Feature becomes active. If a cop symbol appears to the immediate left or right of a thief, the thief becomes extra wild, substituting for all symbols on the reels, beginning with the next spin and does not trigger on the last spin of the Free Games. All Locked Wilds remain in place and under arrest until Free Games end. The Line-Up Bonus activates when the mug shot image appears three times on the reels. 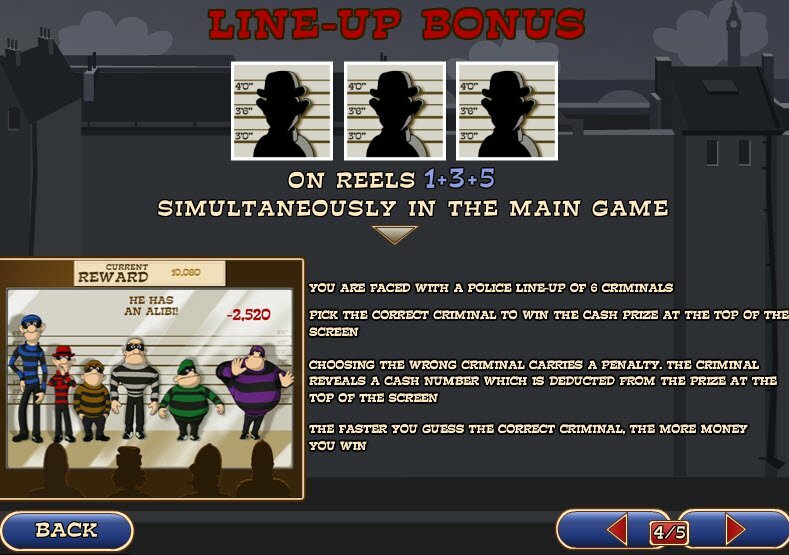 During the Line-Up Bonus, you face a police line-up of 6 criminals.